In 19 Things I Haven’t Told You About Me and My Family, I mentioned that my maternal grandparents were bilingual in Finnish and English and that my mother was also bilingual as a child. It’s funny, but I had never really asked my mother about her history of two languages in any detail, so I thought an interview for this blog would be a good chance to learn more about this aspect of my family tree. Below are the highlights of this interview, conducted via email and Skype. At the same time, perhaps her story can offer us some food for thought as we pursue our own bilingual journey. The era may be different, but the challenge remains much the same. 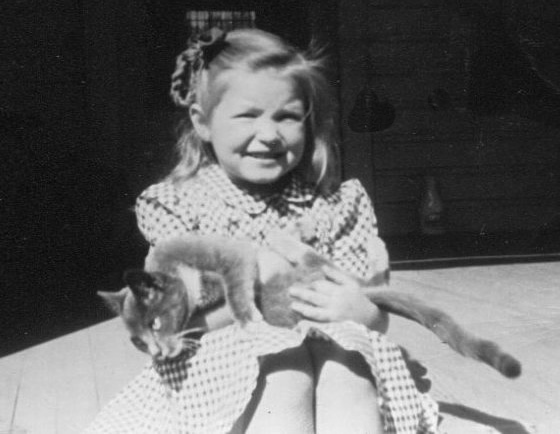 Tell us about your family and how they came to immigrate from Finland to America. I suppose my grandparents immigrated to America in search of a better life. Since I was the youngest child in my family, I didn’t really know my grandparents. In fact, I can’t recall ever having met them, though I might have. 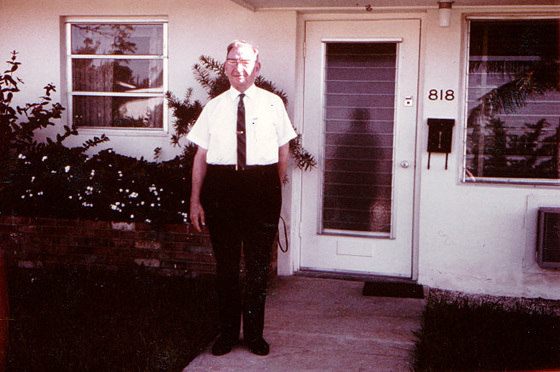 My father’s parents settled in Minnesota where there were many Finns and other Scandinavians. My mother’s parents settled in Massachusetts where there was also a pocket of Finns. When I was young my family didn’t live in either Minnesota or Massachusetts, which made it unlikely that I would have contact with my grandparents. We lived in Ohio. When my father was a young minister, he made a trip to Massachusetts to visit other churches, and met my mother there. They were in Minnesota for a while, before I was born, but then he was called to be a minister at a church in Ohio. My grandfather was a minister, fluent in Finnish and English. Tell us more about your parents, including their bilingual ability. My parents spoke Finnish and English and they spoke both languages very well. My father conducted two services at his church every Sunday, one in Finnish and the other in English. He was very fluent in Finnish, and wrote his sermons in both languages. Although they used English a lot, they spoke in Finnish with congregation members who didn’t speak English well. Musical genes were there, too. My mother’s family was quite musical. Her father was a cantor, a singer, at church, and apparently had a fine voice. 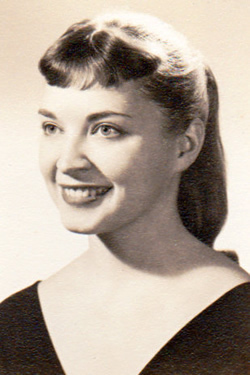 My mother had a fine singing voice, too, and somewhere along the way, she must have had piano lessons. At the churches where my father was the minister, she directed the choir and played the piano. She never had organ lessons, but she played the organ, too. If she had had more education, I think she would have done more with her music. I don’t believe she ever graduated from high school. What was your home life like as a child, in terms of the languages used within your family? As a small child at home, I spoke both Finnish and English, though I can’t recall whether my parents favored one language over the other. It just seemed natural that I spoke both languages and many of the people we knew spoke both languages, too. I do remember speaking Finnish to the mother of one of my little friends. She had come from Finland and she spoke mostly Finnish as her English was quite broken. I think most of the time her kids spoke Finnish to her. Interestingly, this woman came to America on the Titantic. She was one of the survivors. What was it like for you personally, growing up with two languages? I didn’t really continue using both languages. When I started school, I think I became embarrassed about speaking Finnish, and I just didn’t speak it so much after that, even at home. My parents never urged me to speak Finnish more. So we spoke mostly in English, and they didn’t use much Finnish with me. At school, I had new friends who didn’t speak Finnish, so I just naturally spoke English. If I had had other friends who spoke Finnish, that might have made a difference, but we all spoke English. I had no reason to use Finnish, with my friends or my family. In what ways did your parents try to nurture your ability in Finnish? My parents didn’t really encourage or discourage the use of Finnish. I always understood more Finnish than I could speak. In college, my mother went to Finland. Tell us about the year you spent in Finland as a college student. After I finished my freshman year in college, my parents decided to go to Finland for a few years because my father had been invited to serve as minister at a small church there. As I was the only child still at home—and my father was very conservative—I didn’t have much choice about going or not. I didn’t want to leave college, but I recall being pretty excited about sailing abroad for the first time. So that year I lived in Finland with my parents in a small apartment adjoining the church in Lahti. It was the first time for all of us to be in Finland. I was very homesick, mainly because I didn’t speak Finnish well and I was very shy about trying to converse. The happiest part of that year was taking organ and piano lessons with fine teachers, though they spoke hardly any English. Music is truly the universal language! My teachers were disappointed when I left Finland after one year. I think I was their prize American student! After one year I really wanted to go home because my sister was getting married and I wanted to be in her wedding. I also wanted to go back to college that fall. My parents agreed and I sailed home alone. It was surprising that they allowed that! I had a wonderful time on that ship—a big Swedish liner. I danced up a storm! It was really exhilarating to be on my own at last! Did your Finnish improve during your year in Finland? I think I improved, but I was still very shy about trying to converse with others. I knew my Finnish wasn’t very good. In fact, when my parents got to Finland, they found that the Finns in Finland spoke a little differently and this was sometimes challenging for them. Even though they were fluent, the Finnish there was actually a little different from the language they spoke. As an adult, did you ever feel some regret over not maintaining your early bilingual ability? I regret very much that I didn’t retain my Finnish. I could have gotten a lot more out of Finland if I had spoken Finnish well. Had I been more mature, I would have dug in and learned more of the language. I was so sheltered, too, that I began to rebel against my parents. Among six siblings, only my oldest brother spoke Finnish well. He was a scholar and he had a strong interest in the language. He also married a woman of Finnish descent who spoke Finnish. My sister spoke a little Finnish, as did my youngest brother, who also married a woman of Finnish descent. My two other brothers spoke very little Finnish, though I’m sure they did when they were young, like me. 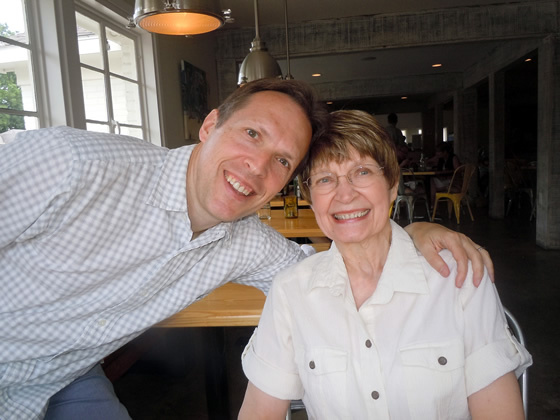 My mother and I during my family’s visit to the U.S. in June 2013. How do you feel having bilingual grandchildren? I’m very happy to have bilingual grandchildren! Their two languages will always serve them well, especially since English is now such a universal language. How about you? Are there bilingual members of your family tree, too? Tell us about them! I loved reading this story about your mum growing up with two languages. My mum is from Dublin and learned Irish right the way through school (as well as a few foreign languages). Her mother was probably equally confident in both languages. She taught Irish as a primary school teacher and corresponded with some people entirely in Irish. In some ways, I kind of regret not being able to share with her the fact that since moving to Wales I’ve become fluent in a Celtic language too. Jonathan, thank you. I’m glad my mother’s story spoke to you and prompted good memories of your own family. Warm wishes from Japan to Wales. When I started working with bilingual families I was so surprised to meet a woman who was not able to speak German, which was her first language. But reading your mum story, I find a lot of similarities and understand it much better. Tiphanya, I appreciate your comment. I’m glad to hear this post offered some useful insight. Adam, you’ve got your mother’s eyes and smile. Can you imagine that Finnish could be your second language? By the way, Adam, since I found your website (less than a year ago) the ability of our toddler to speak Romanian improved so much. It seems just natural to him to speak with me another language. The first thing to do was to clarify that with me he can speak only in the minority language. Again, THANK YOU SO MUCH for your advices! Sometimes he is “blackmailing” me… When he is mad, he says that he is not going to talk to me in Romanian…and he is just 3 years old. But this proves, at least, that he is conscious of the language “status” in our house. Tatiana, you’re very welcome! I’m really happy to hear that your son is making such good progress. Good for you, and good for him! Keep at it, day by day! As for Finnish, I’d love to learn more than just the two or three swear words I know! It was a nice interview with your mother, thank you for sharing it!!! And may I just say that your mum looks very Finnish!!! I can understand how easy it can be to lose a second language. I was abroad for 14 years and hardly spoke Finnish. And I did notice that my only mother tongue did get rusty!!! Not seeing/hearing/using it made it difficult for me to remember right words and I managed to get my sentences all wrong. I suppose I could say English is my second language as I still much rather eg. write shopping lists in English. Luckily my Finnish has come back since moving back here 😉 but at the same time, my English is deteriorating. Johanna, I’m glad you enjoyed this interview with my mother! And thank you for giving me something nicer to say in Finnish than…well, I shouldn’t swear on my blog, right? Just a fun fact, there is still a significant Finnish population in MN, the church I grew up in sang a few hymns in Finnish and had occasional Finnish/English sermons until the late 90s. I was a camp nurse at a Finnish Immersion Camp for two summers! Kiitos (thank you) for a fun read! Very interesting story Adam. Your mom is very pretty too. Thank you for your nice comment, Sashee! Very interesting article that illustrates what happens when parents don’t nurture the minority language: the child follows their instinctive pressure of speaking the majority language so as not to stand out, feels embarrassed to use the minority language in public. And the child once grown up regrets the loss of the minority language. Thank you for this article that acts as a reminder of the choices we make as bilingual parents. Amy, this is well said. It’s true that my mother’s story, though such outcomes may have been even more common back then, remains a cautionary tale for families today. Thank you for sharing this story! It just strengthens my desire to keep at it on my bilingual journey with my kids. My kids have grandparents that are not as on board on this journey, so hearing your mom being happy about your kids being bilingual (coming from the perspective of someone who was fully bilingual as a child and lost some of it as she grew) is really motivating! I’m happy to hear this, Veronica, and my mother will be happy to hear it, too. Yes, please keep at it, day by day. Your perseverance will pay off over time and you and your children will one day be very glad that you persisted past the difficulties.